For me, the highlight of my only visit to this pleasant and picturesque park was the opportunity to hike from our campsite to the top of the sandstone massif, which affords spectacular views across the flat plains surrounding the plateau. 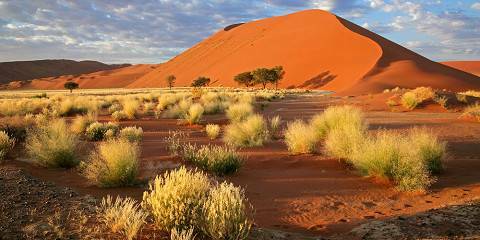 In fact, much of the park can be explored on foot, a rare treat in Namibia. The wildlife here might seem a little underwhelming compared to stalwarts like Etosha, but Waterberg is an important sanctuary for white rhino and rare antelope species such as sable and eland. Leopard and brown hyena are occasionally sighted here, but are generally well-hidden by the dense bush. If you’re a history buff like me, Waterberg is also significant in this regard. The Battle of Waterberg was the catalyst for the Namibian Genocide of 1904-1909. There is a graveyard and a monument inside the park that give some insight into this bloody chapter of Namibia’s history. This elevated park is one of the country's more scenic and unusual wildlife viewing venues. Looming over the surrounding desert and dense with scrub – so dense it's difficult to visually penetrate – the park contains some rare beauties. In fact its isolation makes it perfect for otherwise endangered animals, many of whom have been introduced here and have since flourished. There are a couple of well-built animal hides and while crouching down in one gnawing on a lunch pack that comes as part of the wildlife safari (official activities are the only way to see the park), I saw some of Southern Africa's rarest and most beautiful antelope. Firstly a stately eland made its way into view, cautiously sniffing around the almost dry waterhole. This was followed by a roan and then, the magnificent sable with its majestic curved horns and confident swagger – what a treat. If you’re really luck you may catch sight of leopard, cheetah or brown hyeana skulking through nearby bushes. The Waterberg Plateau is famous for its rare antelopes. The main reason behind the creation of the park in the early 1970s was to set aside a breeding ground for eland, roan and sable. I’m a big fan of antelopes so this, for me, is reason enough to visit, but there are other good reasons too. Fed by natural springs, the steep-sided sandstone plateau supports a tremendous variety of vegetation including grasses, shrubs and deciduous woodland, making this an excellent place to watch birds. To explore, you can join a guided game drive or set off on a guided or unguided, short or long-distance hike – a rare treat in Namibia. Near Otjiwarongo, which is within easy reach of the Waterberg, are Namibia’s two most famous carnivore research projects, the Cheetah Conservation Fund at Elands Vreuge Farm and AfriCat at Okonjima, both of which I can highly recommend. They’re both open to visitors by prior arrangement. You wouldn’t come to Waterberg if you’re on your first safari with dreams of the Big Five. That’s because Waterberg is something of a niche experience, one that combines the chance to see some much-sought-after species (black and white rhino, as well as sable and roan antelope) with some of Namibia’s best hiking. Wildlife can be difficult to see, but the experience of hiking the high country with fabulous views along the way is why you come here – seeing any of these species is a bonus. 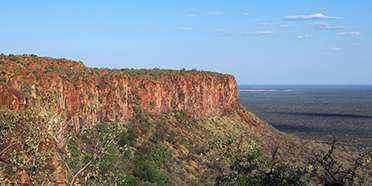 I also like Waterberg because once you leave behind the main access roads, crowds are minimal, although the multi-day hikes are popular in high season. Terrific accommodation options across a range of budgets is another feature of the area. Namibia’s only mountainous game park, Waterberg owes its name to the springs surfacing on its slopes (berg is Afrikaans for ‘mountain’). It has a crown of lush-green vegetation on top, which I found a refreshing and wonderfully scenic contrast to the monotonous, scrubby plain below. Waterberg Camp was a little bland I thought, but its redeeming features are the views of the sandstone cliffs, and banded mongoose and warthog scurrying around; delightfully bush babies also revealed themselves in the trees at dusk. Self-driving is not permitted, but there are organised game-drives (which also stop at hides) and I enjoyed the peaceful nature trails around camp. 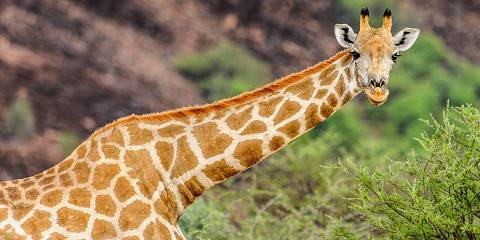 In the early 1970s several of Namibia's endangered species were translocated to Waterberg – the sharp barrier of cliffs protects them – and a number have flourished well. I saw roan, sable, kudu and eland, so overall thought it was a great park to see the larger and rarer antelope, but be aware rhino and leopard are known to be elusive and are rarely seen in the thick bush. This relatively small park has a lot going for it. Comprising a high plateau surrounded by rugged escarpment walls, there is something of a ‘Lost World’ field to the topography. 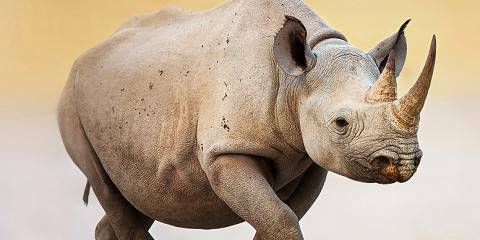 Indeed the biggest beasts – including white rhino, buffalo, giraffe, sable, eland and other large herbivores – are to be found up on top, largely courtesy of an extensive restocking and endangered species breeding programme. You can explore the plateau on guided game drives from Bernabe de la Bat rest camp. I chose to leave the vehicle behind, however, and instead followed a number of excellent hiking trails around the wooded slopes. Among the smaller mammals I encountered were klipspinger, dik dik and large troops of banded mongoose. Leopard tracks were everywhere; indeed most larger predators, except lion, occur in the park – though sightings are rare. This is an excellent place for birders to tick off Namibian specials, and I found Ruppell’s parrot, violet woodhoopoe and Monteiro’s hornbill around the campsite – along with an entertaining colony of ground squirrels. The plateau is also home to Namibia’s only colony of Cape vultures.